UPMC has zero employees, huge balls. Groups. Subsidiaries. Conglomerates. Amalgamation. Brain explosion. But UPMC itself? “We don’t have employees,” Mr. Pietragallo said. Mr. Wood said he sees no contradiction when UPMC claims it employs 55,000 people in marketing and business materials — and no one in court. He did not know which subsidiary employed him nor UPMC CEO Jeffrey Romoff. That person does not work at UPMC Presby, but his paystub says he’s paid by that subsidiary, certainly lending support to UPMC’s claim it has no real employees — just 55,000 people scattered around 37 subsidiaries and therefore, the city’s lawsuit should be thrown out. I get this is how the corporate world operates, but in this case UPMC is being beyond absurd to the point that it is almost insulting to the residents of the city of Pittsburgh and the employees of their 37 subsidiaries, of which Jeffrey Romoff doesn’t even know which is issuing his seven-figure paycheck, apparently. How can UPMC claim to have zero employees and that their widely self-reported 55,000 number is just a “marketing number,” when they officially filed with the Internal Revenue Service claiming they employ 52,000 as a group? 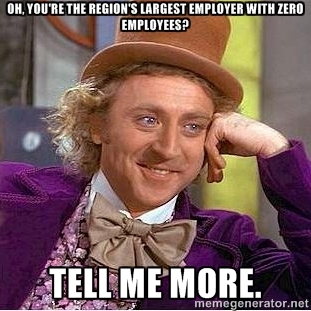 You can have zero employees … or you can have 55,000 employees. You cannot have BOTH zero and 55,000 employees and then just choose which number suits you best for certain circumstances. I mean loopholes are great and all, but at some point, you’re just trying to defy the laws of mathematics and possibly physics and for all I know, gravity. I’m not a corporate accountant. I’m not a lawyer. I’m a Pittsburgher. And as a Pittsburgher and a human with a brain in her head, I am qualified to tell you that this is farcical and insulting and it will only serve to generate even greater ill-will toward UPMC than currently exists among the public who already imagine UPMC as King Kong squashing any puny entity that dares approach its territory. Stop this nonsense and get to work proving you’re a charity, UPMC. Because if you really are, this creative legal maneuvering wouldn’t even be necessary. Math is hard. The truth is easy. Sadly, lobbying money will continue to flow to keep this all going. Common sense and politics have never had much in common. No point in expecting their marriage anytime soon. Having worked for a number of major corporations, I can attest that the “employer” showed on my direct deposit stub changed almost every year, depending on how the org chart was reconfigured for that year. Things were spun-off, acquired, services were incorporated into their own subdivisions. So I’m not at all surprised by what you wrote, and I doubt the courts will be either. And their tax return? Each subsidiary does not file a separate return, they typically file what they call a consolidated return, so I’m sorry, it then does appear that 0=55,000 :) I’m sorry Zima isn’t available anymore, I would drink one with you to alleviate this aggravation. So, naturally, you just kind of make up a number. INFURIATING!! I am going to have to dig up my old “UPMC” W2 forms to see what they say. After the horrendous shooting at UPMC Western Psych…the great compassionate caring non profit awarded the employees who were absolutely traumatized by this event exactly ZERO days off. They had to use their sick days/vacations days and were expected to return to work. All interviewed by the CEO who impressed upon them that all was well…..What a bunch of B.S. I have heard over and over…UPMC treats their employees TERRIBLY..oh wait…no employees…perhaps only indentured servants. Well, I’ve thought for a while now that we didn’t end slavery or indentured servitude, we just transferred it to the middle class. Not a popular opinion, I know, but preventing this situation is a prime function of unions. There, I said it. The “U” word. Don’t hate me ’cause I’m beautiful! I agree with all you said and all the comments, but really want I think warrants comment is your title. Best ever. I sent this around to a dozen people just for the title alone! Have you ever seen the movie “The Prestige”? The Pledge, The Turn, and the hardest part The Prestige…. Is that the one with Bowie, or was that the other one at the same time?